Josee, the Tiger and the Fish is a little difficult for me to review. It’s not the type of movie I would typically seek out to watch, but it does contain some interesting elements. It comes off as a romantic dramedy, centered around several romantic relationships but without being happy enough or having enough funny moments to qualify as a romantic comedy. It is, I suppose, more of a character study of several young people. 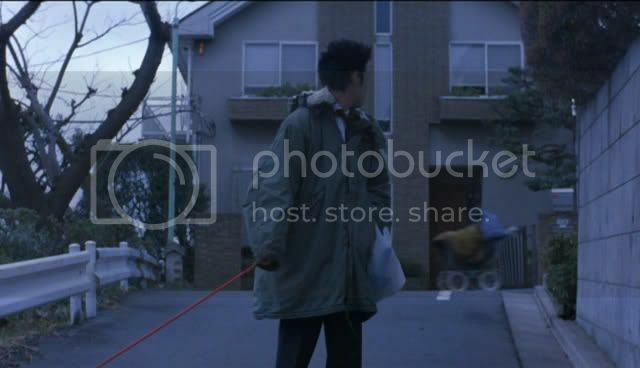 Tsuneo (played by Satoshi Tsumabuki) is a young college student. He works at a mahjong parlor while pursuing various romantic endeavors. I suppose he goes to class occasionally, but this is rarely mentioned or shown. 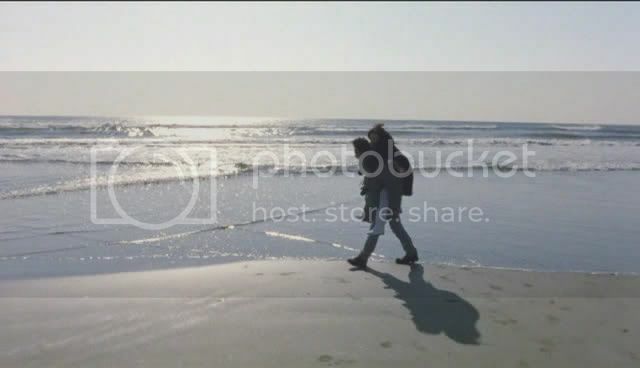 He apparently has a girlfriend at the beginning of the film, but as soon as she mentions that he might be able to land another more attractive girl he races off to do just that. And the previous girl doesn’t seem to mind. That, however, is not the main thread in the story. At the beginning we are also introduced to an old grandmother who pushes around a baby carriage. She’s a bit mysterious, and the mahjong players speculate that she’s running errands for the yakuza. 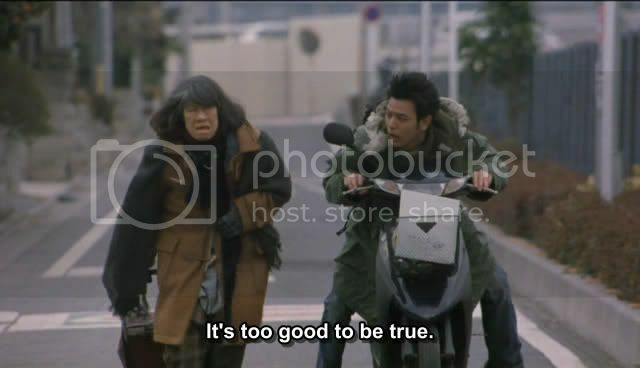 The truth turns out to be a little more interesting, as Tsuneo finds out when he runs into the old lady one day. Inside the carriage she carts around her granddaughter, Josee (Chizuru Ikewaki). Josee has cerebral palsy or a similar disorder and can no longer use her legs. Her grandmother is ashamed of her and will only agree to take her outside in the carriage, covered by blankets so no one can see her. Tsuneo is invited for breakfast after their encounter, and he soon discovers that Josee is an exceptional cook. Eventually he starts stopping by quite frequently and begins to enjoy Josee’s company in addition to her culinary skill. Of course, being a romance film things must not remain easy. He continues to be involved with the more attractive girl mentioned earlier. Her name is Kanae (Juri Ueno, from Turtles Are Surprisingly Fast Swimmers [reviewed here]) and she is hoping to be a social worker. Naturally, this means she is interested in Josee’s living conditions, and pretty soon the love triangle is complete. The story continues to fly by as characters get together, break up, and endure life and relationships together. All of this may sound interesting, and it is to some extent. The film runs almost two hours long, however, and that leads to some dull moments. There’s just not enough plot to fill that much time. Pacing becomes a problem as the film starts jumping ahead in large increments of time. The characters manage to retain their unique identities, however, which is a plus. The ending will please very few among Western audiences, and I personally had trouble finding the ending to remain true to the story and characters. It is a character study, though, and I suppose the characters’ fickleness ought to remain a valid reason for their actions. I enjoyed parts of the movie, particularly the first thirty minutes. There are enough of the absurd and wacky moments that I’ve come to expect from Japanese films to make the movie a comedy, in part. These peter out, however, as the movie shifts its focus onto the two main characters. 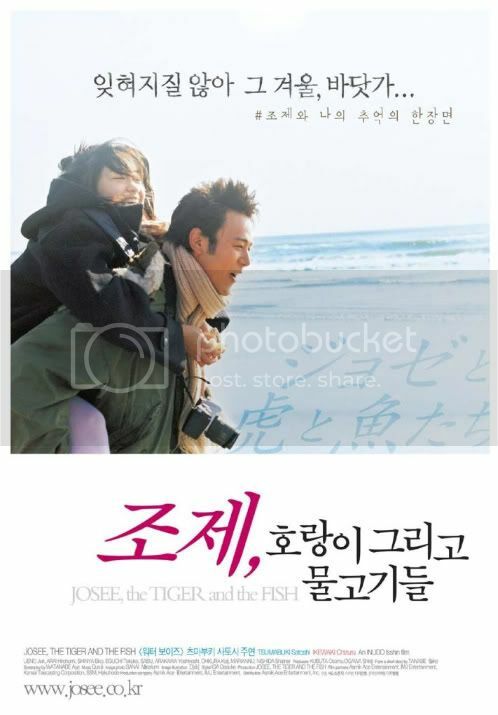 If you are interested in character dramas that are well-made and acted, then you will most likely enjoy Josee, the Tiger and the Fish if you keep an open mind about how it will end. More finicky audiences might not have the patience to keep still for the entire movie. This entry was posted in 1 pirate flag, 2.5 stars, J, Movie Reviews on December 8, 2009 by Tim Irwin. Thanks for the review suggestion, Jurga! Sorry it took me so long to watch this. 🙁 I love suggestions of new movies to review; it helps me discover new aspects of cinema, and I tend to appreciate the films even if they don’t become my personal favorites.